To support the development of an Open Space Master Plan for the Town of Cochrane, Alberta, I developed a parks inventory analysis tool in ArcGIS based on the composite values level of service (CVLOS) methodology described by the American Planning Association. We undertook a comprehensive inventory of parks and amenities in Cochrane. 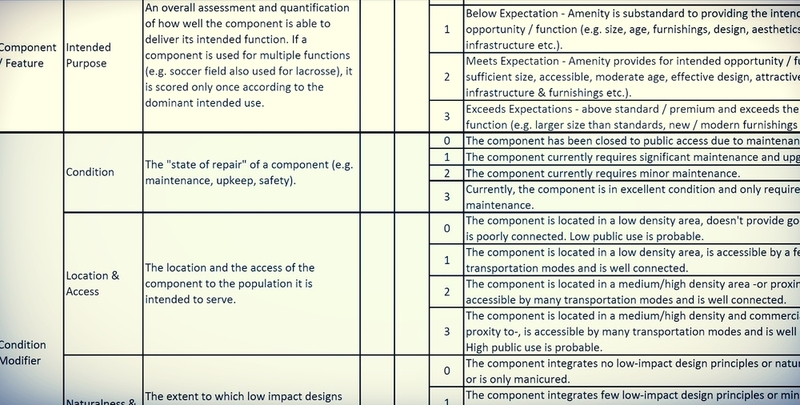 Taking into account condition and quality, variety and number of amenities, usage, and other factors, the tool calculated a score for each park. Using catchment mapping, the tool produced a spatial and tabular summary of the recreation opportunities the Town's overall parks system was providing to residents in areas within walking distance. In effect, the tool illustrated the locations of park or amenity 'deserts'. This information was used in the master plan to make comprehensive recommendations for management and improvements at specific locations.